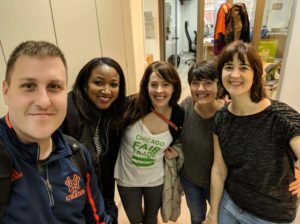 As one of the Fair Trade Campaigns Fellows in the Great Lakes Region, I get to meet and speak with with so many wonderful people through my work. Along this journey I have had the pleasure of getting to know Anne-Michele Boyle, a teacher at Whitney M. Young Magnet High School, who is working in partnership with students to make Whitney Young a Fair Trade School, and so much more. If you are looking for someone who goes above and beyond for Fair Trade, then you have to meet Anne-Michele. She works both inside and outside of the classroom to make sure that the students who walk through the door of Whitney Young High School leave with a clear understanding of how they can advocate for others and make the world a more just and sustainable place. Tell me about yourself, your work as a teacher, and your background. I have been teaching at Whitney M. Young Magnet High School since 2006. I currently teach A.P. World History and Global Citizenship. I created the curriculum for my Global Citizenship classes so I could imbue a sense of global citizenship in my students through an exploration of the United Nation’s Sustainable Development Goals. My class includes a lot of field trips, expert guest speakers and other experiential learning opportunities for students. In addition to teaching, I am the teacher sponsor of our Girl Up Club, STAR (Students Together Assisting Refugees) Club, Fair Trade Club and Dolphin Destinations, our student travel group. Our most recent trip was to Madrid and Paris, this past fall. Our next trip will be Australia in 2020. Prior to becoming a teacher, I worked for the Chicago Tribune as a marketing analyst and later as a sales representative. I have a Masters in Business Administration and a Masters in Education from DePaul University, and a B.A. from Loyola University. I have three super cute kids; Molly, Shay and Nolan that I love to smother in hugs. I love spending time with my kids and husband, as well as my parents, brothers, in-laws, cousins and friends. I love living in Chicago and enjoying all of the great restaurants and museums that we have throughout the city. 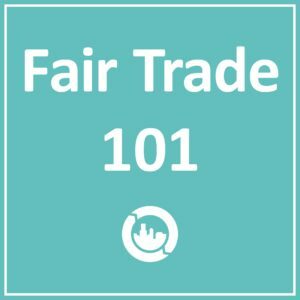 How did you learn about Fair Trade and why did you feel it was important to introduce your students to the Fair Trade movement? I first learned about Fair Trade when I was pregnant with my oldest child Molly. When I found out I was pregnant in 2007, I went straight to Barnes & Noble and bought a stack of pregnancy-related books. Reading the books exposed me to the importance of organic fruits and veggies. This prompted me to start shopping at Whole Foods. Shopping at Whole Foods and being a chocolate lover, I became exposed to Fair Trade chocolate. While I was enthralled with Fair Trade chocolate because of the ethical labor and environmental practices, not to mention the great taste, it took me a long time to realize the basic argument for Fair Trade chocolate should also apply to other products like coffee, apparel, etc. Upon hearing Nasreen Sheikh’s of Local Women Handicraft’s interview on WBEZ Worldview in 2017, I was immediately captivated. I searched and found WBEZ Worldview’s host Jerome McDonnell on the Internet, emailed him requesting his help connecting me with Nasreen so that she could share her story with my students. A bunch of emails later, Nasreen came to my school and talked with my students. After hearing Nastreen’s story, my consumption habits have been forever changed, as have many of my students. How did you introduce Fair Trade to your students, and how did you get them interested in Fair Trade? Whitney Young H.S. 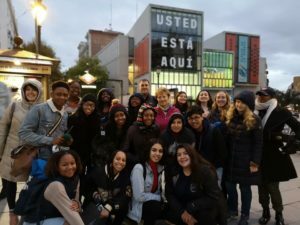 Students in Madrid, Spain, a designated Fair Trade Town, this past fall. 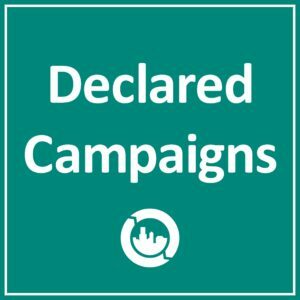 My students and I explore the world’s major issues through the lens of the United Nations Sustainable Development Goals (SDGs). There are many ways that Fair Trade supports the United Nations SDG’s, but our Fair Trade focused lessons are part of our unit focused on SDG 8: Promote sustained, inclusive and sustainable economic growth, full and productive employment and decent work for all, and SDG 12: Ensure sustainable consumption and production patterns. The unit’s resources are a powerful mix of articles, audio stories, documentaries and expert guest dialogue. At the conclusion of the unit, students have a big project that requires them to 1) artistically articulate how connected we are with people and places around the globe and 2) teach their classmates about a human rights or environmental issue associated with something they eat, drink, wear, etc., and then persuade their classmates to improve said issue by making a change to their consumption habits. Whitney Young H.S. students and Anne-Michele meeting with Fair Trade Madrid organizers. What’s one highlight from your class this past year that you’d like to share? 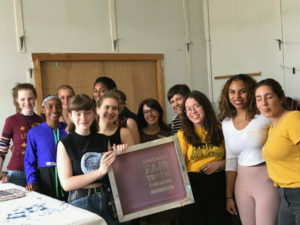 One of the major highlights from last year’s Global Citizenship class was volunteering at the Chicago Fair Trade Festival on Michigan Avenue. We spent all day working the event, passing out Fair Trade chocolate, educating pedestrians about the importance of Fair Trade, and participating in a guerrilla fashion show. It was so much fun, and really empowering for everyone. I am excited that my students will have this wonderful opportunity to educate their community about Fair Trade again this year. 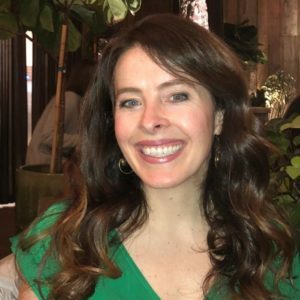 Interested in learning more about Anne-Michele Boyle’s work? Join us in Chicago March 1-3 for our 2019 National Conference! Anne-Michele, along with two of her students, will be speaking at our upcoming 2019 National Conference in Chicago. And she won’t be alone – check out all of the engaging sessions, inspiring speakers and professional development opportunities for students and young professionals, like the Career Fair & Expo.